Vermont’s spring turkey season runs May 1 – 31. 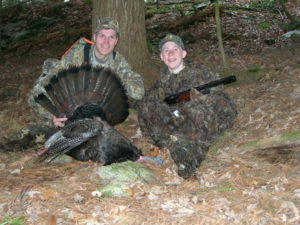 Vermont’s spring turkey hunting season runs May 1-31. Never shoot unless you’re absolutely sure of your target and what is beyond it. Look for a beard, as only turkeys with beards are legal during the spring season. If you’re not sure, don’t shoot. Lack of positive identification could result in shooting an illegal bird, or worse, another hunter. Be sure to have a good backstop any time you shoot a firearm or bow. Never stalk a gobbling turkey. Your chances of getting close are poor, and you may be sneaking up on another hunter. Avoid red, white, blue and black in clothing and equipment. A tom turkey’s head has similar colors. Stick with hen calls. A gobbler call might draw in other hunters. Avoid unnecessary movement. This alerts turkeys and attracts hunters. Don’t hide so well that you impair your field of vision. Wrap your turkey in blaze orange for the hike back to your vehicle. Always sit with your back against a tree trunk, big log or a boulder that is wider than your body. This protects you from being accidentally struck by pellets fired from behind you. Place decoys on the far side of a tree trunk or a rock. This prevents you from being directly in the line of fire should another hunter mistakenly shoot at your decoy. Wear hunter orange while moving from set-up to set-up. Take it off when you are in position.